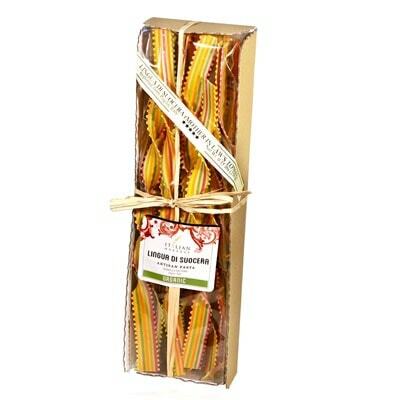 Perfect for all kinds of pasta sauces, you can transform any pasta dish with these Lingua di Suocera pasta. Mother in Law’s Tongues in English, these are organic pasta from Marella. They are not only colorfully fun, but also handmade. Truly another masterpiece by the pasta artisans of Marella. And although they’re a smaller version of the classic Mother in Law’s Tongues pasta, we imagine they are no less sharp as the real thing. No pun intended. Marella Pasta uses only 100% Italian grains. Moreover, all their pasta are handcrafted and are slowly and painstakingly dried at a temperature of only 37 to 38 degrees! A recipient of the 2013 Silver Sofi Award for “Outstanding Product Line”, you will find that Organic Marella Pasta certainly deserves the recognition.